Clydebank set up a Scottish Junior Cup quarter final showdown with Hurlford after brushing Girvan aside 7-1 on Saturday. 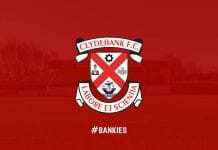 Nicky Little edged closer to the goalscoring record of 65 with a double, with Del Hepburn also grabbing a brace as solitary strikes from Ross Alexander, Jordan Shelvey and Declan Fitzpatrick saw Bankies book their place in the last eight. Manager Kieran McAnespie made three changes to the side that lost to Largs, with Lee Duncanson making his first start at right back while Declan Fitzpatrick and Ross Alexander earned a recall as Liam Rowan, Jamie Darroch and Chris Black dropped out. Bankies flew out of the traps and could’ve been ahead within the first 15 seconds of the game when Jordan Shelvey’s effort from the left wing almost snuck in at Alastair McInnes’s near post. Less than a minute later Shelvey burst through the defence but his cut back was cleared to safety. But it didn’t take long for the visitors to grab their first of the afternoon. Sean Higgins slid a great pass into Little’s feet, with the latter taking a touch before slotting the ball across the goalkeeper for his 20th of the season. Two minutes later Little doubled both his and Clydebank’s lead. Cammy McClair’s corner was met by Little in the air, with the midfielder comfortably equalling his previous tally for each of the last two seasons with the club. It was a flow of constant pressure for Bankies, who added a third twelve minutes later. A driving run from Hepburn saw him set up Ross Alexander, who curled a wonderful shot past McInnes and into the corner to register his third of the season. From nowhere, Girvan got themselves back into the game as they reduced Clydebank’s cushion to two goals. After good work by winger Craig Harvey, the ball fell to Darren Mitchell at the edge of the area and he made no mistake – lashing the ball high beyond Waters. Bankies weren’t phased by the setback and could’ve added a fourth before the interval. On his debut, Duncanson’s cross to the back post was headed on to the post by the stopping Del Hepburn as Bankies went into the break in full control of proceedings at Hamilton Park. McAnespie’s men continued to pile on the pressure and added a fourth just five minutes into the second half. An attempted clearance was sent high into the air, with striker Jordan Shelvey on hand to nod the ball home with a glancing header. Del Hepburn was next to grab a brace – first dancing through the Girvan defence before slotting the ball home – with Hepburn also converting from the penalty spot after Shelvey was bundled over inside the area. The visitors then completed their rout through defender Declan Fitzpatrick as he stabbed home from close range after the ball fell perfectly for the on-loan Clyde man. The emphatic win means Bankies now face last year’s beaten Hurlford United away in the last eight on Saturday February 23.